seeking a topper for your creamy morning oats, or perhaps a batch of hot vegan pancakes? 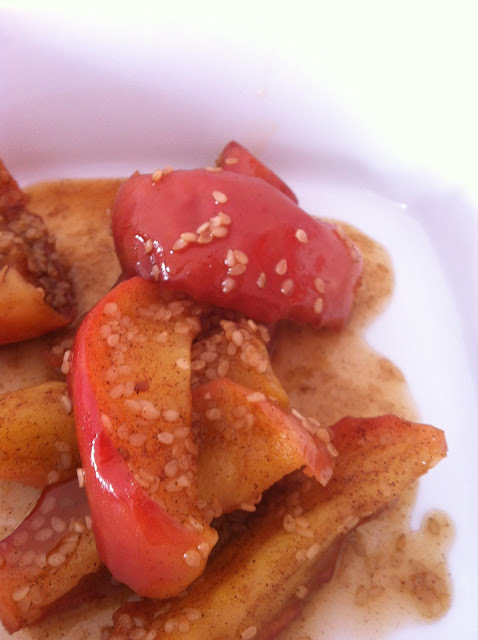 try these sticky cinnamon, sesame and agave syrup apples that are easy as pie to make, super delicious and vegan! coat the apple sections in the other ingredients. place into a microwave safe bowl and cover. cook on high for 5 minutes, or until the apples have softened and the syrup has thickened. allow to cool slightly before serving with a creamy bowl of oats or fresh batch of delicious vegan pancakes - yum!